Azaleas are flowering perennials. Most are shrubs, but some grow more like groundcovers. Standard azaleas can grow up to 10 or more feet tall, while dwarf varieties remain quite small and are often sold in containers. Evergreen azaleas do not lose most of their leaves over the winter, unlike deciduous azaleas, which drop their leaves in the fall. Azaleas are a member of the Rhododendron genus, which has over 6,000 species and cultivars, according to the Azalea Society of America. Evergreen dwarf azaleas can range in height from only a foot or so to around 3 feet tall. "Semi-dwarf" varieties grow up to 6 feet. Container-grown dwarf azaleas are the smallest. Azaleas are attractive shrubs that feature masses of brightly colored flowers, most of which are a shade of white, purple or red. They bloom in late spring with flowers that can last for weeks. The flowers are not the only long-lasting part of the plant. Azaleas themselves can live for hundreds of years, according to the Azalea Society of America. Evergreen azaleas are native to Japan, unlike deciduous azaleas, which are native to North America. Dwarf evergreen azaleas are either true species or man-made. R. indicum is a true species which only reaches 3 feet tall. A popular man-made hybrid, the Satsuki hybrids, were brought to the United States from Japan in 1938, according to North Carolina State University. Satsuki hybrids have a maximum height and width of 4 feet. In general, azaleas prefer climates with mild winters and summers, although this can vary between species and cultivar. Most azaleas thrive in United States Department of Agriculture (USDA) growing zones 6 though 8, according to the Azalea Society of America. Evergreen dwarf azaleas do best when they are protected from the intense rays of midafternoon sunlight. They thrive if exposed to morning sun followed by filtered sunlight or dappled afternoon shade. 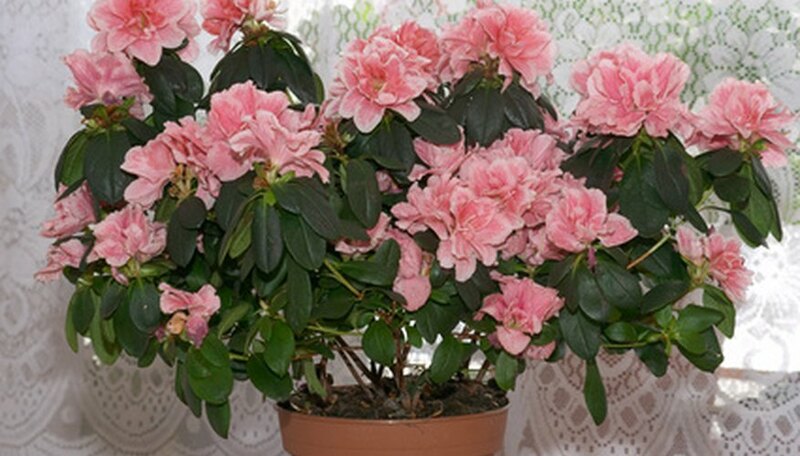 Azaleas in general like moist, well-drained soil, and evergreen dwarf azaleas are no exception. A thick layer of mulch (3 to 4 inches) placed around the plant in the spring will help the soil retain moisture and stifle weed growth. Established azaleas do not need to be fertilized, but newly planted shrubs can benefit from one application of a balanced (10-10-10) fertilizer in the spring. Follow the directions on the label according to the size of your plant. Azaleas can easily contract fungal diseases if the soil is consistently too wet, or if water is left standing on the leaves of the plant. Water at ground level, and never plant an azalea in a location where standing water develops. Caterpillars and azalea lacebugs can also be a problem. Both devour the leaves of the shrub. Spraying your plant with an insecticide can help with insect pest problems.